The Repeal Bill has had a makeover: published tomorrow it has now dropped its less-than-humble adjective. But whether or not the Bill is indeed great, its importance for the environment is as monumental as it was three months ago, when the Government published its plans for the Bill alongside the triggering of Article 50. A report by the House of Commons library predicts that this Bill will be “one of the largest legislative projects ever undertaken in the UK”. Over the last 44 years, EU and domestic laws to protect the environment have become increasingly intertwined, with EU laws playing the lead role in setting standards for, and providing the tools to achieve, the protection of our wildlife, air and water. The idea behind the Repeal Bill is to ‘roll over’ EU-derived laws into domestic law, such that the law will be the same on the day that we leave the EU as it was the day before – vital if we are to maintain protection for the environment and the regulatory stability that businesses require. In reality, it’s a lot more complicated than you might think, and, as I have highlighted in recent blogs , the potential risks to the environment are huge. The Repeal Bill needs to carry over both the nitty-gritty detail of European directives and regulations, and the big-picture thinking which informs both their aims and application. We’re particularly concerned about the EU’s over-arching environmental principles enshrined in European Treaties, such as the polluter pays and the precautionary principle. These common-sense principles underpin the European laws that protect our nature, air, water and seas – but unless explicitly translated into the Repeal Bill, may be lost. So, even if the ‘rolling over’ of the detail of the individual laws was done to perfection, protection for the UK’s environment would be substantially watered-down if these vital principles are not also translated into domestic law. As EU laws are ‘rolled over’ into domestic law, the UK Government has plans to give its Ministers the power to amend the legislation as they go. Some technical changes will be needed (for example, references to European agencies and institutions may need to be changed to new or existing domestic agencies and institutions), and it will be important that Ministers are able to make these changes to ensure that the roll-over process can be completed in time. But these so called ‘delegated powers’ must not be abused. If not sufficiently constrained, they could allow Ministers to make significant changes to the law - a role usually reserved for Parliament - to ensure that material changes to our laws are subjected to full democratic scrutiny. Such a power to amend laws behind closed doors could pose an unacceptable risk to the environment. It is crucial that any changes to the intent or scope of EU laws are made only through full democratic processes and are given full parliamentary scrutiny. Laws on paper are only as good as our ability to enforce them. They require good governance - and at present we rely on EU institutions to provide most of that too. Those institutions provide guidance and funding, sets targets and monitors environmental progress to ensure things get done, monitors and polices compliance with our environmental laws, and can provides affordable access both to justice and remedy. Leaving the EU will therefore leave us with a big ‘governance gap’. We’d like the UK Government to provide clarity on how they intend to fill the ‘governance gap’ left in the wake of Brexit – a particular challenge in the face of the sustained loss of independence, resources and expertise from the environmental agencies across all four countries of the UK, and at a time when access to justice in UK courts is being further restricted (see here). In all this, it’s vital to remember that our nature, air, water and seas are not constrained by national borders and therefore coordinated action to protect this shared environment is essential, from the quality of our sea water to the safety of our migratory species. However environmental matters are largely devolved and at this stage it is unclear how the Repeal Bill will impact on this. What is clear is that the four countries of the UK will need to work collaboratively together, and beyond UK borders, to ensure that high standards of environmental protection are maintained and that we are able to effectively address our cross-border environmental issues. The Repeal Bill is a crucial moment for environmental protection. Please visit our Repeal Bill campaign page where you can email your MP to remind them of their crucial role in making sure our environment is protected throughout the Brexit process. 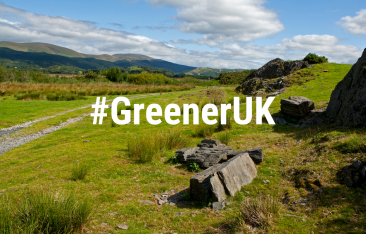 You can find out more about the Repeal Bill and its impact on the environment in this Greener UK briefing. Is the RSPB and Greener UK position too weak? "It is crucial that any changes to the intent or scope of EU laws are made only through full democratic processes and are given full parliamentary scrutiny." Agreed. Good. However, I disagree with the RSPB's comment here (see please visit our Repeal Bill campaign page): "Robust laws and clear plans are vital if the UK is to CONTINUE to be a global leader in this area." I think by using the word "continue" the RSPB is inadvertently misleading the public and RSPB supporters. "GeneWatch UK PR: Defra battles to keep public in the dark over GM industry influence on policy and media." This link is very important. and here (the UK is NOT a global leader in Pesticide Regulation, please contact Georgina Downs, UK Pesticides Action Network for documentation and more information about "weak" positions). The Woodland Trust have a Position Statement on GMOs which acknowledges the problem of GM Cross Contamination. Further information can be found on GM Freeze's website and GM Free Scotland.